Quartz may be the second most common mineral on our planet’s crust, but everyone from the ancient Egyptians and Australian Aborigines to modern-day New Age practitioners believe that this crystal holds mystical or healing properties. While they hold a prominent place in metaphysics, some varieties of quartz - like smoky quartz and amethyst - actually derive their beautiful colors from defects in their crystalline structures. Many natural gemstones have colors caused by ligand field effects (see emeralds) or charge transfer (see sapphires) within the crystal structure. Defects known as color centers within the crystal structure may alter its natural color. Defects may be introduced by heating or by irradiation. This may occur naturally; for example, some crystals change color following prolonged exposure to the UV rays present in sunlight. Within the jewelry industry, this effect has been exploited to produce intense gem colors, though it is now general practice to disclose any treatment affecting gemstone color. 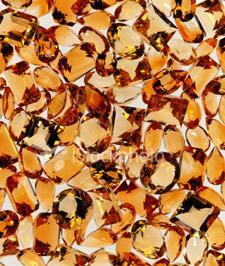 Naturally colored gems are more highly valued than those that have been treated. 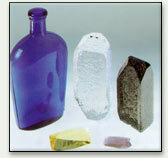 Take a century-old glass bottle, and expose it in the desert to the ultraviolet radiation present in strong sunlight. Come back after ten years, and the glass will have acquired an attractive purple color. Heat the bottle in an oven, and the color disappears. Next, expose the bottle to an intense source of energetic radiation, and within a few minutes an even deeper purple color appears. Color centers: A century-old glass bottle has been irradiated to form "desert amethyst glass" (top left); colorless synthetic quartz crystal as grown (top center); one that has been irradiated to form smoky quartz (top right); a synthetic citrine quartz, colored yellow by iron impurities (bottom left); and one that has been additionally irradiated to form amethyst (bottom right). "Desert amethyst glass" acquires its color from a color center, as do the colors of the natural gemstones amethyst, smoky quartz, and blue and orange topaz. Many other materials, both natural and man-made, can be irradiated to produce color centers, including irradiated blue, yellow, and green diamonds. Some of these colors, such as those mentioned, are perfectly stable, losing their color only when heated. Other color centers are unstable and fade when exposed to light, while others fade even in the dark. What is a color center? A color center is a defect in a crystal structure. These defects are generally introduced by extreme heat exciting and freeing electrons, or by bombardment with natural or man-made radiation. Color centers fall into two categories: electron color centers and hole color centers. In both cases, the color center is able to absorb only specific energies corresponding to specific incident light wavelengths, and the color we see is the complementary color to that, or those, absorbed. 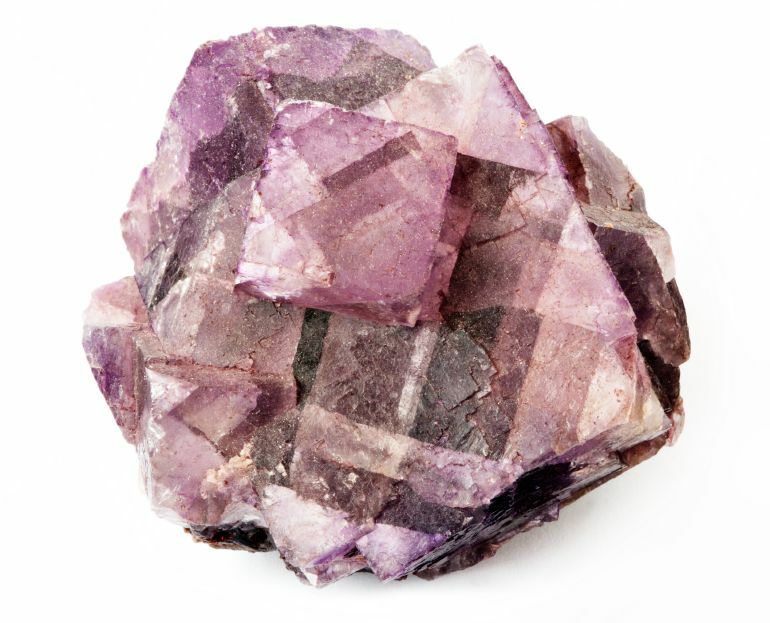 Fluorite is built with alternating calcium ions (Ca2+) and fluorine ions (F-). 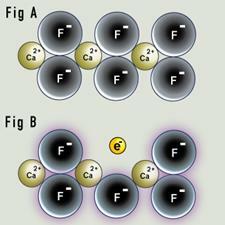 Every positive calcium ion is surrounded by negative fluorine ions, and vice versa. The electrical attraction between the positive and negative charges creates strong bonds in the crystal. In its pure form, fluorite is transparent, but the hallmark purple of fluorite is caused by a flaw in the crystal known as a color center. Fluorite occurs in a wide variety of colors, and is also fluorescent. Purple fluorite. A negative ion may be missing from the structure, creating a site that will attract and trap any free electron. This defect is sometimes known as a Frenkel defect. This creates an electron color center, as in fluorite of a purple color. In classical transparent fluorite (Figure A), the crystal lattice has a regular distribution of fluorine and calcium ions. In Figure B, a fluoride ion has been displaced. The gap left behind is surrounded by positively charged calcium ions, and strongly attracts electrons. A free electron has moved into the gap and been trapped there, creating a color center we see as purple. The term "F-center" is interchangeable with "color center," after the German "Farbe" (color). When fluorite is bombarded by high-energy radiation (cosmic rays from outer space or gamma rays from a radioactive source), a fluorine ion can be ejected from the crystal, creating a vacancy. Momentarily, the crystal is no longer electrically neutral: it is missing a negative charge. To regain stability, it grabs an available electron close to the crystal and sticks it in the vacancy. 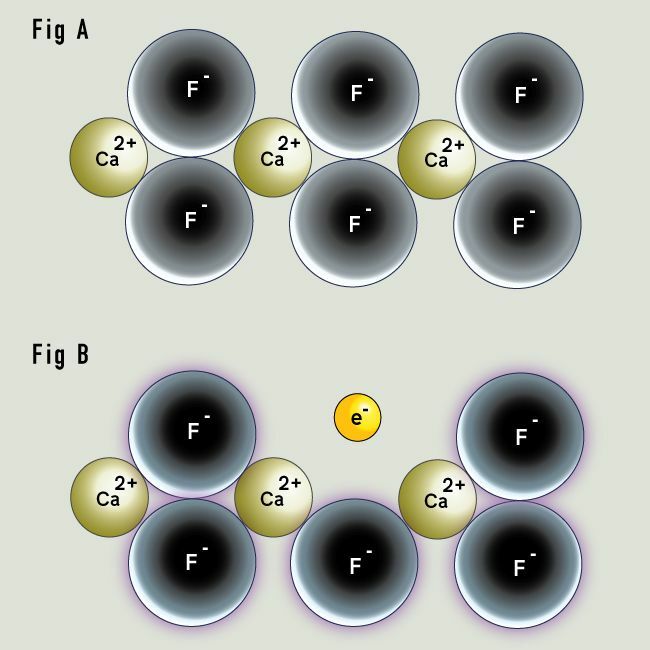 With the electron replacing the ejected fluoride ion, there are now equal numbers of positive and negative charges in the crystal, and the electron is held firmly in place by the surrounding positively charged calcium ions. 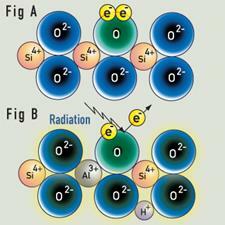 An electron has replaced the original fluoride ion. The trapped electron is responsible for the purple color of fluorite, and is known as a "color center." A color center produces the color in much the way the impurity does in the ruby crystal. The color center can also exist in an excited state, and the energy needed to reach that excited state is equal to the energy of a visible photon. The color center absorbs energy in the form of photons in the yellow range of the spectrum by jumping to its excited state; what we see in the crystal is the complementary color, purple. Colorless "rock-crystal" quartz is composed of silicon oxide (SiO2). Irradiation, either man-made or naturally occurring while the quartz is in the ground over many thousands of years, converts colorless quartz to smoky quartz. Schematic representation of creation of a "hole" color center. Quartz consists of a repeating unit of SiO2. In smoky quartz, aluminum typically replaces one out of every 10,000 silicon atoms. The aluminum is in the form Al3+. A hydrogen or sodium ion (H+ or a Na+) will always be found nearby to neutralize its charge. The addition of Al to the SiO2 structure (about 1 Al atom for every 10000 Si atoms) results in a change in color in the crystal. If Al3+ replaces the Si4+ ion in the SiO2 framework to maintain electrical neutrality of the crystal, a proton (H+) could be present. 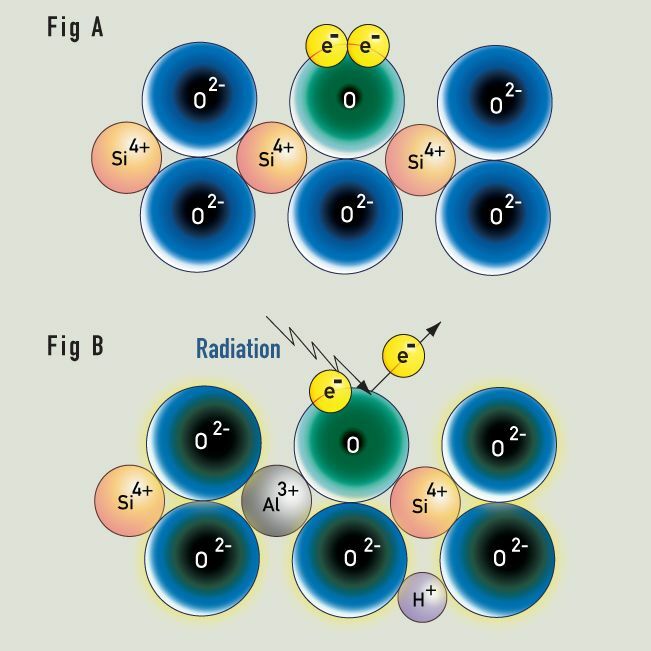 If irradiation ejects an electron from an oxygen atom near the aluminum ion, the electron can be trapped by the proton. The whole (AlO4)5- entity creates a "hole" color centre, being converted to (AlO4)4-.The hydrogen atom does not absorb light. (AlO4)4-) absorbs light to produce the gray-to-brown-to-black color of smoky quartz. 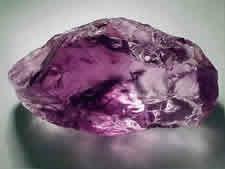 The characteristic violet hue of amethyst is caused by the presence of color centers. Topaz is a silicate mineral of aluminium and fluorine with the chemical formula Al2SiO4(F,OH)2. 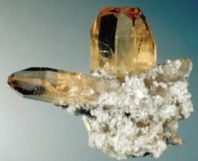 Natural yellow-to-orange-to-brown precious topaz contains a color center stable to light; any colorless topaz can be irradiated to a similar color, but it is usually unstable and when exposed to light, fades in a few days. 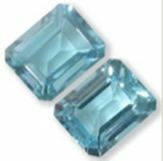 Blue topaz also contains a color center, which can be either natural or synthetic; both are stable. If the energy required is small enough, the material may even fade in the dark at room temperature. 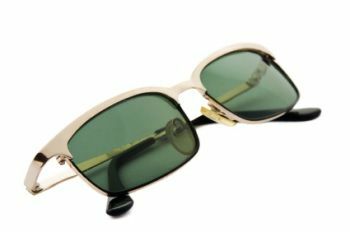 This principle is used in eyeglasses with photochromic lenses, in which the ultraviolet rays present in sunlight darkens the lenses, which then fades indoors at room temperature. The electron can only be freed from the "trap" when supplied with sufficient energy to move beyond the attraction of the positive ions. This can happen if the crystal is heated to a few hundred degrees Celsius, and results in bleaching of the color center. In some materials, light energy from illumination may be sufficient to free the electron, leading to optical bleaching. The colors of both amethyst and smoky quartz are stable to light, but are lost when heated to between 300 and 500°C. If not overheated, the color center and the color can be restored by another irradiation, and so on. Other color centers are possible in alkali halides; these may absorb light in the visible, the ultraviolet, or the infrared ranges. Some of these color centers also show fluorescence, which in turn can function as laser materials. As alternatives to irradiation, color centers may also be generated by crystal growth in the presence of excess metal, or by solid-state electrolysis. The exact nature of many color centers is unknown. Interestingly enough, the irradiation of colorless diamonds can produce stable yellow, blue, brown, and green colors. Although irradiated yellow and blue diamonds are similar in appearance to the yellow caused by nitrogen and the blue caused by boron (see diamonds), they are far less valuable, and can be distinguished by spectroscopic and other features.